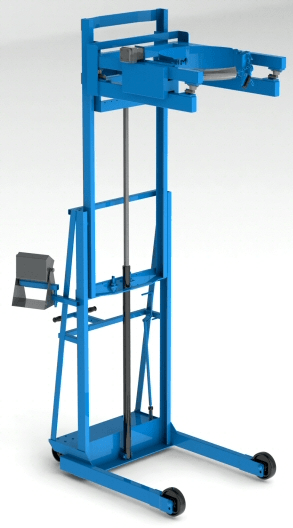 Scale-equipped Vertical-Lift Drum Pourers eliminate the need to move to a separate drum scale. Weigh as you pour! 60" (152 cm) high. Model 515-N-114 shown. 106" (269 cm) high. Model 525-N-110 shown. These drum handlers with scale make it simple to raise and pour a heavy drum. 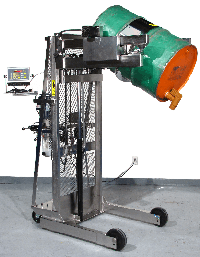 Scale-equipped drum handlers allow you to weigh your drum while you pour to dispense precise amounts as needed. No need for a separate weighing station. You control the drum pouring angle and height while you dispense. The compact base and quality components of this drum handler make it easy to maneuver. Even pour your drum with a drum faucet or drum cone in place. Know the weight of what you have poured! The digital indicator displays drum weight while you dispense from your drum. The structure is engineered to sum downward components of force and factor out variation of forces caused by tilting a drum to pour contents. This design, combined with digital electronic instrument, provides a measurement to the nearest 0.1 Lb. or 0.1 kg while handling a drum weighing up to 800 Lb. (363 kg). Accuracy of +/-0.2 % of displayed weight. Scales have numerical touch pad for tare entry. "T" in model # = Intrinsically safe scale indicator for hazardous Division 2 environment. "N" in model # = NOT for hazardous areas. 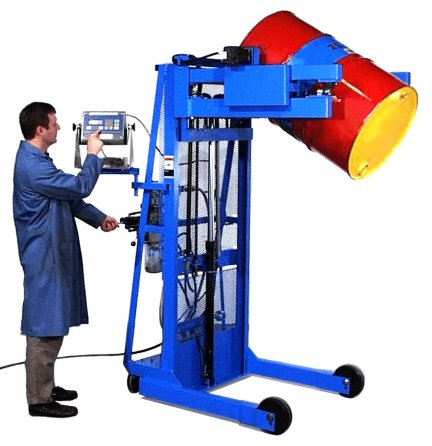 Scale-Equipped Vertical-Lift Drum Pourers weigh drum while pouring. Drum handlers with scale designed to weigh drum while pouring at up to 106 inches high. More than just a drum dumper. . . they provide controlled drum dispensing.